Small business owners now have more productivity tools at their disposal than ever before. This has allowed owners to organize, streamline, and automate many of the processes of their daily operations. The problem is, navigating the seemingly endless sea of business applications has become a job in itself. 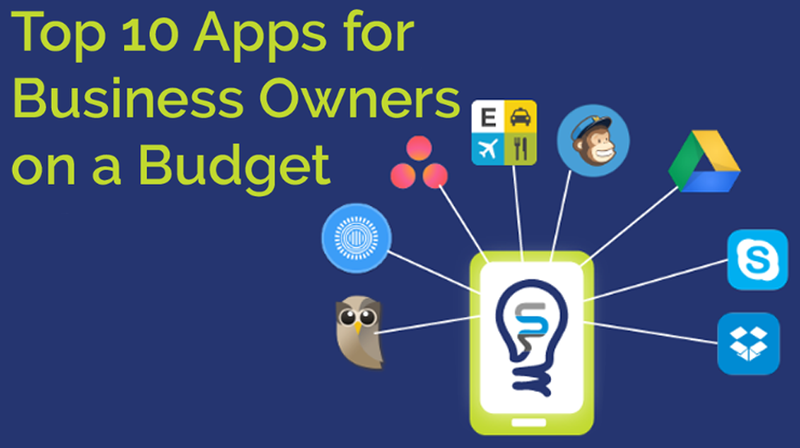 A new infographic from Smarter Business has complied affordable apps for budget conscious business owners. Titled, “Top 10 Apps For Business Owners On A Budget,” the infographic has affordable applications which work together to make you more productive. Skype is a proven and reliable communication platform. And best of all, you can make Skype to Skype calls for free. With Skype video conferencing, you can bring up to 25 colleagues and team members together and still not pay a dime. Google Drive has a suite of business applications, communication and storage solutions in one platform. And just like Skype, these features are free. The Google cloud platform allows you to collaborate with your team no matter where they are. You can sync across emails, edit documents in real-time, and use the 15GB of free storage to archive the work. If you need more storage, you can get 100GB for only $1.99 per month or $9.99 for a terabyte. Tracking your expenses is part of running a small business. With FreshBooks, you can track all your invoices, expenses, projects, and even your time. The app also lets you automate your workflow so you can save time by eliminating manual processes. The company has 70 new app integrations to make FreshBooks work seamlessly with many popular apps. The price depends on the number of clients you have. And it starts at $15 per month for 5 billable clients. Social media is a must for many small businesses. Hootsuite is a social media managing platform which brings your channels together under one roof. The app lets you schedule your posts, report on your online presence, gather content and measure performance. Hootsuite has a free version, but the premium tiers have additional tools for managing and monitoring your social media efforts. Email is still one of the best communications tools for business. MailChimp has automation features designed to simplify the process of sending emails. Whether you are launching a limited or large marketing campaign, MailChimp has the tools for creating, managing, and tracking the performance of each email. Even the free version gives you 2,000 subscribers and 12,000 emails per month. The $10 Grow plan ups those options to unlimited subscribers and emails. Some businesses require regular reporting when it comes to expenses. Expensify is designed to specifically address these businesses by simplifying this tedious process. The app scans your receipt, automatically transcribes the details, applies for reimbursement, and creates a report outside of the office. The cost is free to the end user, but the person approving the reimbursement will pay $5 per submitter/ month. Managing teams has become much easier thanks to digital technology. Asana is a work management platform which brings everyone together. Team leaders can manage, plan and structure projects by setting priorities and deadlines and sharing details in one place. A free version can bring up to 15 team members together. And the premium tiers have more features, including more team members starting at $9.99 per user/month. A website is the digital storefront of a business. Wix is a DIY website builder with drag and drop functionality for quickly and easily creating a fully functional website. The features on Wix allow you to create a website with its Artificial Design Intelligence or the Wix Editor. This includes the ability to add advanced functionality such as mobile optimization, SEO, eCommerce, and more. You can create a free Wix website, but the paid packages, which start at $4.50 per month are well worth the price. If you are still using PowerPoint, Prezi has an innovative platform for creating engaging and interactive presentations. The canvas-based tool uses a drag and drop interface to create timelines, historical references, and chronological data. At the same time, Prezi is able to track how users are viewing and where they are engaging most. The personal Standard tier starts at $5 per month, with the Plus going for $15 per month. Although it is last on the list, Dropbox is an extremely powerful and essential tool for today’s businesses. It lets you store and organize all your files for easy access. And you can share the files with your clients and interact with your team from virtually anywhere. Dropbox is also a great tool for storing your important information. The free version gives you 2GB of space and for $20 per month, you can get as much space as your team needs. Take a look at the Smarter Business infographic below.